Republicans thought people could save for it. Democrats thought government could provide it. Both are wrong. Caring for an aging population is beginning to strain our economy and stress out a rising legion of caregivers. Political parties have taken turns over the past 50 years controlling government and they have both failed to solve the problem. Now we are stuck in neutral and rolling backwards. By 2020, forty-three states will see an increase of over 70 percent in their 65 and over population compared with just 20 years earlier. And 29 states will see an increase of 70 percent in their 85 and over population during the same period. In fact, only 1 state, Arkansas, will see an increase of less than 50 percent in both the 65- and 85 and older demographics. This is an amazing success story in longevity, but a problem that the government, our friends and neighbors, and the economy is unprepared to absorb. First of all, nearly all retirement and health care projections are based on a working population capable of supporting older residents. Unfortunately the percentage of working age adults is decreasing. In 2010, 60 percent of the U.S. is aged 20-64. By 2030, the proportion of these working ages will drop to 55 percent. The age dependency ratio, the proportion of seniors to workers, will almost double over the next 20 years — from 21 per 100 workers to 39. This “silver tsunami” is also creating a legion of people caring for adults and the elderly. Twenty-nine percent of the U.S. adult population, or 65.7 million people, are caregivers, including 31 percent of all households. These caregivers provide an average of 20 hours of care per week. American caregivers are predominantly female (66%) and are an average of 48 years old. That puts working Baby Boomers in their prime working years balancing a career with caring for aging parents and raising their own children. The sandwich generation, as this group had been called, often reduces the number of hours they work. An even greater number continues to work but loses focus and becomes more stressed. For employers this translates to lower productivity, more accidents and mistakes, and the loss of talent. As the aging tsunami breaks on the shores of our economy, new challenges will alter the workplace landscape. Political parties are clearly divided on how to fix the problems. Solutions will come from individuals and local communities. Employers that recognize opportunity in this sea of change will reap the benefits as our workforce and nation grows older. The more things change, the more different generations of workers become the same, suggests a new study about generational views on careers from Robert Half. The research shows that workers of all ages have a new appreciation for company stability when making career decisions. Yet, four out of 10 professionals polled said they are more inclined to look for new opportunities outside their firms as a result of the recession. Cross-generational teams bring challenges and rewards. Nearly three-quarters (72 percent) of hiring managers said managing multigenerational work teams poses a challenge. But more than one-third of workers polled felt having a group of employees at different experience levels increases productivity. What are the most significant generational differences when it comes to workforce planning? Generational views on next career steps differ. For Gen Y, looking for a new job is the most common post-recession career plan, whereas Gen Xers polled said they are more inclined to update their skills. For baby boomers surveyed, staying put at their companies was the most commonly cited post-recession career plan. More Gen Yers (36 percent) than Gen Xers (30 percent) and baby boomers (24 percent) planned to look for new job opportunities. Gen Xers polled were more inclined to enhance their skills sets (38 percent) and build tenure with their companies (33 percent) in the aftermath of the recession than other generations. A greater percentage of baby boomers (54 percent) than Gen X (46 percent) or Gen Y (39 percent) respondents said they will work past the traditional retirement age. More Gen Xers (34 percent) than baby boomers (27 percent) said they had increased their retirement savings since the recession began. More baby boomers (54 percent) than Gen X (45 percent) or Gen Y (35 percent) employees identified the greatest challenge when working with multiple generations as having differing work ethics and approaches to work/life balance; more Gen Yers attributed difficulties to differing communication styles (29 percent for Gen Y versus 16 percent for both Gen X respondents and baby boomers). But different generations don’t always see the world differently? Many generation similarities do exist. “Understanding the values shared by nearly all employees, particularly in light of changing economic conditions, can help companies enhance their recruitment and retention efforts,” said Max Messmer, chairman and CEO of Robert Half International and author of “Human Resources Kit For Dummies,” second edition (John Wiley & Sons, Inc.). For all generations surveyed, working for a stable company and having job security were two of the most important aspects of the work environment, beating out having a short commute or working for a socially responsible company. When evaluating employment offers, salary, company stability and benefits were the most important factors for all three generations. Health care coverage, dental coverage, vacation time and 401(k) matching were the highest valued benefits for all generations surveyed. The most commonly cited benefit of being part of multigenerational work teams was bringing together various experience levels to provide knowledge in specific areas. For nearly four decades Baby Boomers have been in the driver’s seat of politics, consumer trends, lifestyle decisions, and jobs. But 2010 was supposed to be the turning point when Baby Boomers left the workforce en masse, retired off into the sunset, and turned the workforce over to heir apparent Generation X and the up-and-coming Millennials. But thanks in part to the recession, for the first time on record there are more seniors than teenagers in the American labor force. 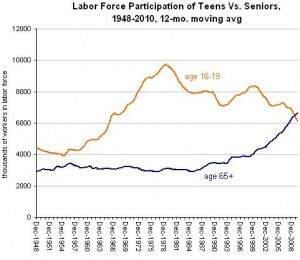 The orange line in the chart refers to the number of teenagers — workers aged 16-19 — who are in the labor force, meaning they either have jobs or are actively looking for jobs. The blue line shows the number of workers over age 65 who are in the labor force. As you can see, starting last fall the number of older workers surpassed the number of teenage workers for the first time since at least 1948, when the Labor Department first began collecting statistics. If you look at just the employment of older workers versus teenagers — that is, how many workers actually have jobs — you will also find that older people surpassed teenagers for the first time recently, in mid-2008. A recent New York Times article cited three primary reasons for the flip? 1. There was always a certain percentage of Baby Boomers and the oldest generation, the Veterans, who would continue to work. 2. Older people are having to work longer. 3. The shift away from defined-benefit pensions toward defined-contribution pension plans, plus the sharp declines in equities since the financial crisis have all conspired to make it more difficult for older people to retire. 4. A weak economy plus a higher minimum wage might be discouraging employers from hiring teenage workers. Regardless of the cause, joblessness in the Gen Y (aka Millennial) Generation is beginning to make history. According to a recent Pew Research Center survey, a smaller share of 16- to 24-year-olds are currently employed — 46.1% — than at any time since the government began collecting such data in 1948.At best long-term implications of low unemployment for young workers include young adults living at home longer, higher college enrollment, and more internships. But a deep concern is growing how delayed entry into the workforce will translate into employee preparedness, not to mention the loss of lifetime earnings. More older people needing work + more younger people giving up on work = grandparents surpassing grandchildren in the labor force. But that’s only a short-term statistic? Are we prepared for the long term consequences? Businesses may be able to erect a firewall to limit an employee’s access to Facebook, Twitter, and YouTube. But they can’t erect a fence high enough or deep enough to prevent dissatisfied and disengaged young workers from leaving their jobs despite a weak job market. According to a recent Deloitte survey, nearly one-in-three (30%) employees are actively working the job market and nearly half (49%) are at least considering leaving their current jobs. Academic research indicates that 44% of these employees will actually act on these turnover intentions. Employers, on the other hand, hardly see what may be coming. For example, only 9% of surveyed executives expected voluntary turnover to increase significantly among Generation X employees in the 12 months following the recession. That stands in sharp contrast to Deloitte’s survey results: about one-in-five surveyed Generation X employees (22%) have been actively job hunting over the last year and only 37% plan to remain with their current employers. Members of Generation Y also have their sights set on better opportunities, with less than half of those surveyed (44%) reporting they plan to stick with their jobs. Among the executives surveyed, 65% expressed concern about losing high potential employees and critical talent to competitors in the year following the recession. Nearly half (46%) recall that voluntary turnover increased following the 2001-2002 recession. Nevertheless, only 35% have an updated retention plan in place to keep hold of talent as the recovery strengthens. Key question for talent leaders: Do you know what your employees really want and are you tailoring your strategies to address the generational and geographic diversities of your workforce? The assumption that NBA superstar LeBron James would demonstrate blind loyalty to his hometown Cleveland Cavaliers should surprise no one – as long as they had been paying attention to the world views of different generations. While Baby Boomer and Veteran workers placed a high value on undying loyalty to the organization, Generation Y (born 1980-2000) are looking for opportunity, mobility, and work-life balance. One survey, released in 2004 by Harris Interactive, found that only 47% of those 18 to 34 years old “really care about the fate” of the enterprise for which they work. That compares with 64% of those 55 and older. In other words, younger workers don’t see themselves sticking around in any one place too long. Ironically they don’t see themselves as disloyal. Loyalty for Generation Y, sometimes called Millennials, feel loyalty is as much as spiritual thing as it is physical. A recent analysis by Princeton economist Henry Farber shows that the percentage of private-sector male workers who’ve been with the same employer for at least 10 years fell from 50% in 1973 to just 35% in 2006, and the proportion of those with 20-year tenures dropped from 35% to 20% over the same period. The erosion in loyalty is not the fault of Generation Y alone. Greedy corporations, widespread outsourcing, and wholesale layoffs have soured almost every generation toward blind loyalty to the business enterprise. In his book, “The Trophy Kids Grow Up: How the Millennial Generation Is Shaking Up the Workplace,” Ron Alsop cites a study in which two-thirds of 18- to 28-year-olds said they plan to “surf” from one job to the next. And 44%, he reports, go so far as to say that they’d renege after having accepted a job if a better offer came along. The over-hyped LeBron James saga is over but how it played out should serve as a wake-up for every executive and business owner. Throwing buckets of money and lavish benefits may still work when acquiring top talent but it’s no longer enough to retain high-potential and high-performing young workers. Does body art and tattoos bias hiring managers? We make hundreds of judgments about people every day, many of them based on personal preferences. Personal prejudices don’t stop at the office door either. This poses a particularly compromising situation for employers. Since the whole interview process is essentially one big judgment session, why would you think a manager would just look away from body art (aka tattoos) and body piercings? Today’s hiring managers tend to be from a generation when tattoos were limited to Marines, bikers and gypsies. When these managers interviewed for their first jobs, even facial hair for men and open-toe shoes for women were a no-no. Today, facial hair is commonplace and hair length runs from the shaven head to a neatly tied pony-tail. Female candidates arrive to the interview with cleavage exposed and “dressy” flip-flops. If you take a look around most workplaces today, employers have either given up trying to regulate dress code or just don’t care. But that still doesn’t stop candidates from getting under the skin of hiring managers with almost any display of tattoos and piercings. That’s a problem because 40% of adults ages 18 to 40 now have a tattoo or non-earlobe piercing, according to the Pew Research Center’s Gen Next Survey. Young workers — even those going through business school and looking to be corporate leaders one day — have ramped up both the number and placement of this body art. Such markings started to become more mainstream due to the tattooed punk movement of the 1980s. This has created a firestorm of activity to create personal appearance policies that include rules about tattoos and piercings. But as many employers will tell you, it’s not that easy without discriminating against certain classes of workers and without significantly reducing the size of the talent pool. In fact, despite all the talk from HR and management about the unprofessional appearance of candidates, just 36% of organizations surveyed by the Society for Human Resource Management had a policy for body piercing; and only 22% had policies for body art. That compares to 97% of organizations that maintained policies on clothing and 70% on footwear. Candidates and employees often feel the employer has no right to restrict the display of piercings and tattoos. That’s not true. Companies can limit employees’ personal expression on the job as long as they don’t infringe on their civil liberties. According to the Equal Employment Opportunity Commission, employers are allowed to impose dress codes and appearance policies as long as they don’t discriminate against a person’s race, color, religion, age, national origin or gender. Companies faced with inked and pierced applicants can demand eyebrow rings or tongue rings be removed and tattoos covered to help project the proper image to customers. That is because some customers, particularly older ones who dislike tattoos, could be turned off and they may be less likely to do business with it. Loss of business is a justifiable reason to restrict the display of body art in whatever form it takes. But that doesn’t mean it’s easy to enforce. For instance, let’s say you deem it okay for a female employee to have a maximum of two visible piercings, limited to the ear. But you forbid male employees from wearing even one earring. Does this open up the employer to gender discrimination? What if the nose piercing is a religious tradition? Does this exempt the employee from the policy? Employers will be expected to prove that any policy is job-relevant and just driven by personal preference or bias. Those who disapprove of inked-up and pierced workers must learn to accept those who are willing to follow company guidelines and request that these employees cover up their tattoos and jewelry — or face a shrinking pool of applicants too. Like facial hair and long hair for men and open-toe shoes and mandatory skirts and stockings for women, tattoos and piercing policies will eventually become relics. I expect there will be a sea change in attitudes toward tattoos in the next 25 years as tattooed and pierced peers begin running more companies. But what goes around comes around. I wonder how the next generation of workers will test their bosses regarding what’s acceptable attire in the office. Then again, the concept of “going to work” is already becoming a thing of the past. Every day I read through dozens of Google Alerts, RSS feeds, emails and newsletters but don’t know what to do with all the information. So in the first of a series of posts, here are few random, yet sobering, thoughts on the U.S. Labor Market in 140 characters or less – Twitter-style. There is a finite pool of talent worldwide. Support for our technological and physical infrastructure is in short supply. Technology has increased its pace whereas educational advancement and talent creation have slowed down. An obsolete 20th century education-to-employment system can no longer cope with the realities of a 21st century global labor market. 40% of workers in the United States and Canada have basic workforce education skill deficiencies. Only 25% of America’s current eligible workers comfortably meet the new job criteria. About 95 million adults are reading at or below the 8th grade level of comprehension, disqualifying them for most well-paying jobs. More than 90 million U.S. workers currently lack the reading, writing and math skills to do their jobs properly. Compare this to Brazil, where 88% of adults and 97% of youth are literate and 70% of students complete high school. Although 64% of high schools graduating seniors enter some form of post-secondary education, only 25% graduate with a college degree. 15% of U.S. high schools produce 50% of all the dropouts. Young people are eager consumers of technology, but not interested in working in technology careers. Recruiting, retaining and developing skilled people will become so challenging that many businesses will be forced out of existence. Computers did not cause mass unemployment, but they did create a major upheaval in the nature of work. 75% of U.S. jobs will require both a good liberal-arts-based general education plus post secondary technical training. The current education-to-employment bureaucracy chokes the innovation and change we need. Most of these random throughts were highlights from “Winning The Global Talent Showdown” by Edward Gordon. Ed will be my guest on my radio show, Workforce Trends, on June 16 at 11AM EDT. Tune in! Based on my random thoughts for this week, I must ask: Are employers underestimating the complexity and pace of change? What do you think? When a company is sourcing an open position, it pays to have as many tools in their recruiting tool box as possible. One of the hottest recruiting tools these days is Twitter. Not a day goes by that I don’t receive a dozen or more blogs, articles and invitations to webinars about how to use Twitter for advertising jobs and sourcing candidates. What’s even better, I’m even starting to read a few success stories. But truth be told…while Twitter is today’s media darling, its use is still not mainstream. Twitter is a recruiting tool with tremendous potential but it currently lacks universal appeal. With time, that scenario may change. Nonetheless, I do encourage clients to use Twitter to publicize job openings and even connect with potential candidates because every little effort helps in that search for the diamond in the rough. You just don’t know how and where you’re going to find that next good employee fit. But just creating a Facebook Fan Page is not enough. Successful candidate sourcing on Facebook requires a strategy – a relatively easy, low-cost, 3-step strategy but a strategy nonetheless. 1. Create a Custom Facebook Landing Page for your company. This can be accomplished quite easily by installing a free Facebook application called Static FBML. This application allows you to create a custom design with basic html code, like the one I created for my client Quantum-Services. A graphic designer can create an image for you to post to your landing page or you can use a program like AdKreator. This is a fantastically easy program for non-graphic designers like myself. I used AdKreator to create the ad for my client and my pages as well. With the Static FBML application, you can then add and name a new tab such as “Now Hiring” to the menu bar. Facebook users can click on the tab to apply for jobs. Equally important is that you don’t have to be a Facebook user to see Facebook Business Pages. These web pages are public profiles, searchable by the likes of Google and other search engines. In effect, a Facebook Page is like having a free website on the most popular networking site in the world. Non-Facebook users who find your site when searching are directed to any page you choose. In this case, my client elected to direct visitors to the recruiting page. But you have the option to direct them to any page on your Facebook site. You can even create multiple pages and test the responses. 2. Engage candidates on your Wall. Good candidates are looking for the right place to work just as much as employers are seeking the right candidates to hire. Before they apply, they want to know what it’s like to work for your company. What’s management like? What are the employees like? Getting employees to post updates about their daily activities gives candidates an honest, inside look at the job. Having employees respond to questions posted by candidates is an excellent way to engage them at the front-line and differentiate your company from the competition. 3. Post video clips of what it’s like to work at your company. Record interviews with employees. Give a tour of your facility. Demonstrate what a new hire might expect on his or her first day. These can be added on the same landing page or by creating a second one. The easiest way to display videos on Facebook is to upload them to YouTube and link the YouTube video to a landing page. That pathway also offers the advantage of your videos getting viewed on YouTube (and searched on Google since Google owns YouTube.) You can also upload them directly to your Facebook site. You can also run contests to encourage employee participation in monitoring and posting updates to the site as well as referrals. The more activity on the site, the more likely your Facebook Business Pages rank will increase in the search engines and the more likely candidates will find you. Click on the link for a free step-by-step guide to creating a custom Facebook landing page. SBR Consulting, a Charlotte firm specializing in helping companies attract, retain and reward different generations in the workplace, has just published their first of three studies on how the Great Recession is affecting the Millennial generation. The results suggest that due to poor management and poor handling of layoffs, 70% of respondents who were laid off would not go back to work for their company and 55% are either unsure or do not want to work for corporate America again. It also reveals another significant clash of styles between generations. Veterans, born before 1946, and older Baby Boomers (born between 1946 and 1954) pledged loyalty to the company in good times and bad. Layoffs were taken in stride because what was good for the company in the short term was good for the employee and community in the long run. When older generations were laid off or even fired, they did not talk about it at home. They certainly did not broadcast it to the world. The Millennial generation, however, was raised on 24/7 breaking news and instant messaging. They share personal information readily. They are not afraid to talk about being laid off. They are even moral vocal about how their layoff was handled. These conversations and perceptions are then shared with hundreds of friends and thousands of strangers via social media sites like Facebook, Twitter and LinkedIn. That’s bad news for any business that handled a layoff poorly. Not only is this news spread virally, but now that Google and other search engines are indexing tweets, updates, and blog posts, this bad news creates a permanent digital imprint for anyone to see. A battered reputation poses a significant risk for any business that handled it badly. The study found that early warnings of layoffs and respect throughout the process meant a great deal for Millennials that were subsequently laid off from their jobs. “It’s not personal, it’s business” does not work for this generation. They take layoffs personally. Only 34% felt the company cared about them during the layoff process and left with a positive perception of the company. Compare that to the 64% who received no warning of a looming layoff. Only 12% of this group felt the company cared about them during the layoff process and left with a positive perception of the company.